Aerovate’s self adjusting propeller technology allows for maximum operating efficiency over a wide flight profile significantly improving climb and cruise performance. The system is completely self-contained and easily adapted to existing and emerging high performance unmanned gas powered or electric power systems. ANRA Technologies is an industry-leading provider of enterprise grade, open and off-the-shelf commercial drone operations software platforms for end to end commercial drone operations as well as for UAS traffic management. Ascent AeroSystems designs and manufactures unique “coaxial” drones that are more portable and durable than conventional multi-rotors. Its rugged cylinder-shaped vehicles scale to any size and are ideal for industrial, public safety and military markets where mission-critical operations in tough environments are the norm. Hundreds have been shipped worldwide. Digital Aerolus’ new technologies for the UAV marketplace bring safe, stable flight to indoor and GPS-compromised environments. Its technologies are perfect for inspecting inside buildings, tanks and around infrastructure, as well as providing warehouse inventory assurance and immediate intelligence for high-risk security threats. Its integrated management of separate drone and sensor views enables the development of vision-driven AI behaviors to bring truly autonomous drones to the market. Drone Complier is commercial drone flight management software for organizations and government users. Its software solutions help operators plan their missions, manage their platforms, comply with government regulations, and extract meaningful insights from their operations. Intuitive and adjustable, Drone Complier enables customers to easily scale operations without scaling support or administrative infrastructure. EZ3D™ is a full software solution designed to quickly inspect, measure and document roofs with consumer drones. Easily gather photos of the whole building exterior with a standard DJI drone and upload them to the cloud. Detailed photos are available for inspection and can be turned into measurements for repair estimation in a detailed, industry standard plan. LiquidPiston, Inc. develops advanced internal combustion engine technologies and platforms based on a proprietary thermodynamic cycle with significantly greater thermal efficiency than the current Otto (gasoline) and Diesel cycles. Our mission is to fundamentally improve engine power density and fuel efficiency as well as reduce greenhouse gas production. Luftronix develops and sells precision scanning solutions for the aviation industry. Unscheduled inspections cost the airline industry billions every year due to their unpredictable nature and effect on schedules and resources. Luftronix drones provide a light-weight and cost-effective solution that leads to enormous reduction in the time an aircraft spends out of service. OneSky is a new business unit of Analytical Graphics, Inc. (AGI) established to provide Unmanned Air Systems (UAS) Traffic Management (UTM) and safety of flight analytical services. Capitalized with an exclusive license to AGI’s proven physics based software platform and predictive analytics, OneSky provides the enabling infrastructure to enable safe beyond visual line of sight (BVLOS) operations for the commercial UAS marketplace. Using patented technology exclusively licensed from NASA Jet Propulsion Lab and Caltech, Seatrec harvests clean energy from temperature differences in the ocean to power underwater floats, gliders and AUVs. Harvesting energy from air-sea temperature differences in the Arctic and day-night temperature differences in off-grid remote locations is under development. Venrock ... and many more! 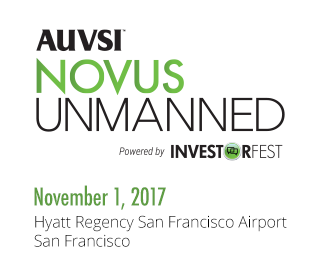 Register now or contact us at meetings@auvsi.org to sign up for a Startup Demo Table while space is available!